Person who flies a hang glider; an experienced pilot can skillfully use air currents to stay aloft for several hours at a time. Insulated bag attached to the harness that might be equipped with a reserve parachute; the pilot slides into it to maneuver the hang glider from a prone position. Part where the harness is attached to the hang glider frame. 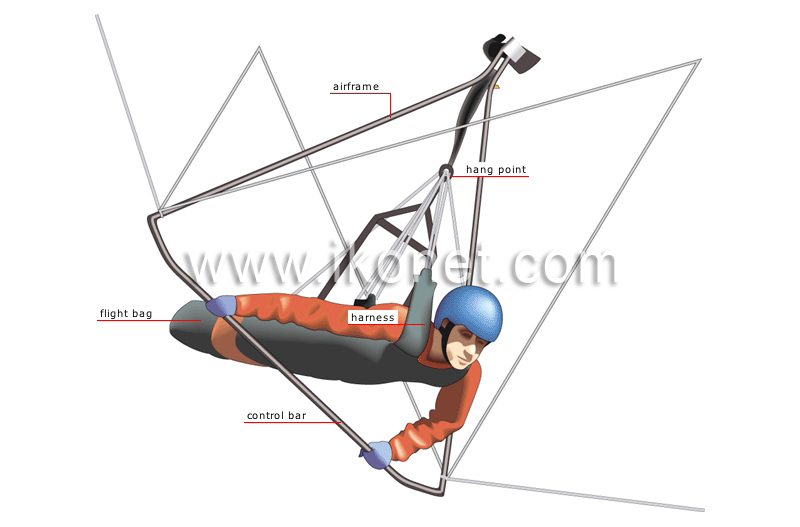 Arrangement of straps that connects the pilot to the hang glider. Lower part of the airframe that enables the pilot to maneuver the hang glider. Triangular metal skeleton at the intersection of the keel and the crossbar.